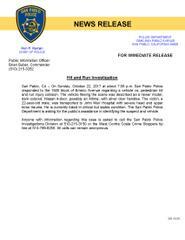 San Pablo, CA – On Sunday, October 22, 2017 at about 7:08 p.m. San Pablo Police responded to the 1500 block of Emeric Avenue regarding a vehicle vs. pedestrian hit and run injury collision. The vehicle fleeing the scene was described as a newer model, dark colored, Nissan 4-door, possibly an Altima, with silver door handles. The victim, a 22-year-old male, was transported to John Muir Hospital with severe head and upper torso trauma. He is currently listed in critical but stable condition. The San Pablo Police Department is asking for the public’s assistance in identifying the suspect and vehicle. Anyone with information regarding this case is asked to call the San Pablo Police Investigations Division at 510-215-3150 or the West Contra Costa Crime Stoppers tip line at 510-799-8255. All calls can remain anonymous.